Spending Christmas abroad may not be something that you have recently thought about doing, if your anything like me then your quite traditional and have very simular Christmas's each year. But while watching the film Home Alone - Lost in New York, it got me thinking about what it may be like if I was to spend Christmas abroad one year. I just love everything about that Christmas film and I think the thing that feels so exciting is having something that is so familiar like Christmas, seem unfamiliar as your celebrating it in a different place. I have never really wanted to go to New York though. So I started to think, where would I go if I could spend Christmas somewhere new. So I headed to Destination2 to get a little inspiration to where I could travel. For me I would need to head somewhere that is still cold at the time of Christmas, has a chance of snow, and still has a nice traditional Christmas feeling. I must be able to see Christmas Tree's and I just don't think I would feel very Christmassy staring at a decorated palm tree. So I decided that Copenhagen in Denmark would be the perfect place to take a Christmas trip. It is cold there at that time of year and there would be that chance of snow. I would spend most the holiday walking around taking in the impressive buildings all decorated up while doing some of my favourite Christmas activities. 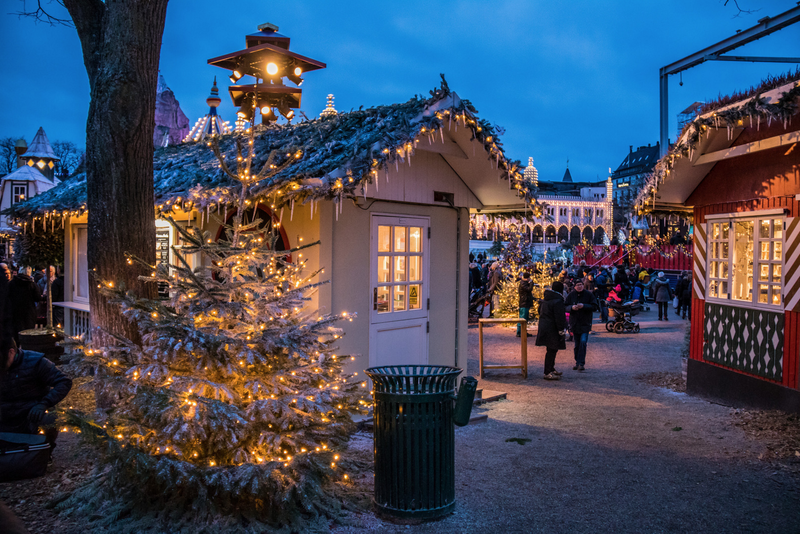 One of my favourite things to do at Christmas is attend a Christmas market and I read that Copenhagen has a pretty impressive one. And you know what it is like when you are on holiday! You let your self spend that little extra and so I could definetly treat myself rather than just browsing. If I was spending Christmas in Copenhagen then I would have to try and stay in a big posh hotel. Perhaps the Grand Hotel if I'm really treating myself. I think that if I was waking up on Christmas morning, then I would have to wake somewhere that was warm, cosy and comfortable. Christmas is one of the days of the year where you really don't want to worry about anything and room service breakfast would have to be done. Although Im not sure they would serve my usual pate on toast. Before hand I would have to make sure that Lily and I wrote to Father Christmas to make sure out presents would be delivered and explain to Lily that he will deliver gifts where ever we are in the world. I think spending Christmas abroad would be very different to my usual Christmas, but as I am such a traditional person, I think Copenhagen would suit my usual Christmas needs. Where would you love to spend Christmas abroad? Austria, Switzerland, Australia are countries I would consider visiting around Christmas Time. I would love to go to New York at Christmas, to see the big trees decorated, go in the toy shops and see all the displays decorated... A bit like Home Alone! I am traditional though,i have to be at home for Christmas, make our dinner, quality family time and its hubby's birthday Christmas day and he will be 40! There are lots of places in America I'd happily spend it, and I think your idea of going to Copenhagan is brilliant too! I think if I was going abroad for Christmas I'd like to go somewhere cold. I'd happily spend some time somewhere warmer either side of the festive season, though! I'd love to go away one Christmas, I'm not sure where yet, but I'm sure that it would make a lovely change. I go to visit my Mum at Christmas, so I don't think that I 'd consider being awake for Christmas. Would maybe go around Christmas Time / Winter. I believe my sister did once go away on holiday over Christmas and New Year, and did enjoy the holiday. Don't think I'd consider a holiday at Christmas with children, they can have a great time at home with family, friends, their presents / toys, etc. Love christmas things like this, proper christmas cabins! New Zealand with my family and in the sunshine would be good for us. Definitely Lapland for me, that would be something really special! I do like Christmas markets.